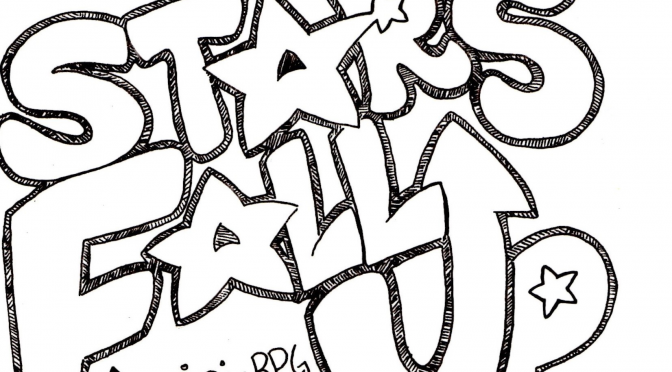 Stars Fall Up is a light and simple RPG contained within a zine, made for anyone with any amount of roleplaying experience to pick up and play with friends. Players guide the ups-and-downs lives of disillusioned millennials in Pilot City, a locale inspired by the magical realism aesthetic of Scott Pilgrim, Steven Universe and Bee and Puppycat. The players cooperatively create the setting and the issues the characters encounter without the need for an omnipotent Game Master. The rules of the game also encourage characters to rely on their bonds of friendship to alleviate emotional stress and gain extra energy to overcome daily hardships. Sorta like real life, only everyone’s probably got cooler outfits and better hair. At the present time, Stars Fall Up is sold at Modern Myths in Northampton, MA, and at conventions that BloodLetterPress tables at. You can also buy one straight from us via email inquiry. It’s like, late-90’s old-school!